Couples often seek marriage counseling because of unresolved conflict. Every relationship will have issues, but marital conflict can be especially painful. When there is an argument and there isn’t repair, we often feel disconnected and discouraged. Famous relationship expert John Gottman suggests that it is as vital to learn how to repair from an argument as it is to take care of one’s own physical health. The longer a rupture goes without repair, the greater the chance of withdrawal into stony silence, resentment, and contempt. The good news is that even the most successful relationships have conflict. Gottman suggests that it’s not the appearance of conflict, but rather how it’s managed that predicts the success or failure of a relationship. He goes on to say that learning how to “manage” conflict is more important than “resolving” it. This is because relationship conflict is natural and it actually has functional, positive aspects—like allowing for vulnerability and emotional intimacy. So, how do you repair after there has been a rupture in the relationship? Perhaps you’ve sought out marriage therapy and learned some helpful strategies. Let’s say you have tried the direct communication skills that my colleague Dr. Moorman outlined in our Finding Solutions blog, “What’s the Key to a Happy Relationship and Marriage?” These include empathy, “I” statements, and making requests. But maybe you try this and an argument still erupts. You need a format that can guide you and your partner through repair. Terrence Real, the founder of the Relational Life Institute, advises taking a break for at least 30 minutes to allow for physiological soothing and then using the following repair process: The Feedback Wheel. To get ready to use the Feedback Wheel, ask your partner if he/she will listen to what you have to say. Getting their permission allows you to know that they are ready to talk. If they are not ready to talk, ask your partner to set a time that they will be ready to talk. At this stage, it’s also helpful to remember that your motivation is that you love your partner. When your partner is more grounded and less triggered, you are ready to start the Feedback Wheel. 3. How you feel about it: Joy, sadness, anger, fear, hurt, love, shame, loneliness. 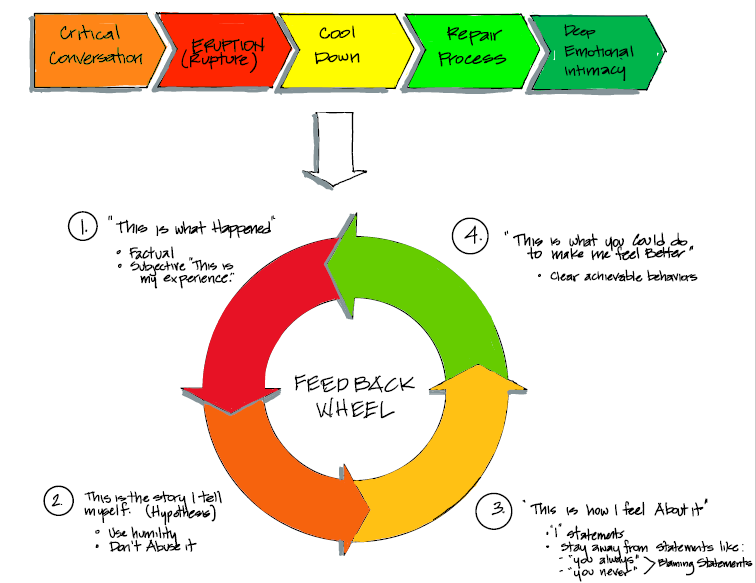 In essence, the Feedback Wheel consists of communicating with your partner about what happened, how you viewed it, how you feel, and what you want. Whether in marriage counseling or on your own, talking through the steps of this wheel can help you understand why the conflict happened and how to manage it. Here are some things to keep in mind as you work through the steps of the wheel. Make sure that when you express what happened, you stay with the facts and keep it behavioral. Even this brief fact-sharing can get argumentative if you start placing blame. If your partner becomes defensive, remind him or her that this is your subjective experience. They may experience it differently, but that this is your recollection. They will get their turn to share their experience later. For example, suppose your partner says they will be home for dinner at 7:00, but ends up coming home late. This step gives you an opportunity to say the hard stuff. However, it’s important to use humility and not abuse it. Leading with an “I feel _____” statement helps the speaker stay away from blame. Using “I” statements helps you avoid saying things like “you always” or “you never,” which often make the receiving partner defensive. Belinda Real, a famous marriage therapist, suggests going with the emotion we are experiencing other than anger. She suggests skipping over the first feeling (often anger) and going to the next. In the example above, the hurt partner could say “I feel angry,” but it may be more helpful if he or she could go with the next emotion: “I feel sad because I miss you,” or “I feel afraid that being late will become a pattern and that I won’t be able to do anything about it,” or “I feel shame that I’m unworthy or unloveable.” These convey primary feelings that can provoke compassion and understanding from a partner. This is probably the most important step because it actually is the REPAIR! This step puts the request in specific behavioral terms. This is different from stating a demand, which can easily provoke or agitate your partner and lead to more arguments and escalation. Instead, this gives the receiving partner a clear, achievable way that he or she can honor the speaker’s needs in the future. Pia Melody, a pioneer in the field of marriage therapy, notes that our attention span for listening to a partner who’s unhappy with us is about four sentences long. Thus, she encourages partners to try to keep each step to one or two sentences. By using the 4 Step Feedback Wheel when there’s been a rupture, you are telling the truth to your partner without provoking defensiveness or reactivity. Relaying your thoughts and feelings with this format will help you learn how to cherish your partner while standing up firmly for your own needs. By learning this skill, you will be able to imbue your relationship with fierce emotional intimacy, which in turn can keep passion alive.